The road to pro football success was a difficult one for Kemp, taken in the 17th round of the 1957 NFL draft by the Detroit Lions after playing collegiately at little Occidental College. He saw scant action in the preseason but, after Head Coach Buddy Parker resigned and then took over in Pittsburgh, he was traded to the Steelers and threw a total of 18 passes during his rookie year. Waived a game into the 1958 season, he caught on with the New York Giants and saw no action as a member of the taxi squad. Failing to catch on with Calgary of the CFL in ’59, he sat out the season and went back to college, but appeared to get another chance at the NFL with the 49ers before being declared ineligible due to his having signed earlier with the CFL. With the advent of the AFL in 1960, Kemp finally got his chance with the Los Angeles Chargers and led the league in passing while throwing for 3018 yards and 20 TDs (along with 25 interceptions) and a league-leading 7.4 yards per attempt. The Chargers won the Western Division and he was named All-AFL. The Chargers moved to San Diego for ’61 and repeated as division champs while Kemp was selected to the AFL All-Star Game. A finger injury suffered during the 1962 season caused him to be waived by the Chargers in an attempt to save a roster spot, but he was claimed by several clubs and awarded to the Buffalo Bills. 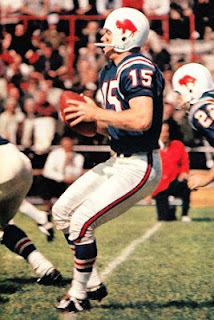 Kemp was an AFL All-Star in 1963 and ’64 and the team tied for the Eastern Division title in ’63, losing to the Patriots in the resulting playoff, and then won the AFL Championship in 1964. Highly mobile and quick to take off from the pocket, Kemp also had a strong arm, good leadership skills, and was tough, playing through injuries throughout his career, although also prone to throwing interceptions. Bills went 10-3-1 to finish first in the Eastern Division. Won AFL Championship over San Diego Chargers (23-0). The Bills won a third straight Eastern Division title in 1966, and Kemp was again an AFL All-Star, but the team lost to Kansas City in the league title game. The club declined quickly thereafter, and Kemp missed all of 1968 with a knee injury. He came back for one last year in ’69 before retiring to go into politics. 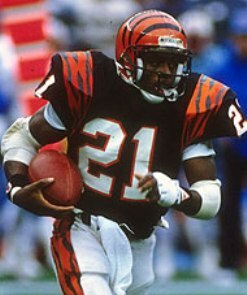 Overall, for his pro career he passed for 21,218 yards with 114 TDs and 183 interceptions, but while he tossed more interceptions than touchdowns in every season of his career, the statistics didn’t tell the whole story as he was also successful with a 65-37-3 record as a starter, compiling two AFL championships, six AFL All-Star Game selections and two All-AFL selections. He went on to a long second career as a Congressman, cabinet member, and Vice Presidential nominee. His son Jeff became a quarterback in the NFL. One of Buffalo’s two first-round draft picks in 1979 (the other was LB Tom Cousineau, who went to the CFL instead), Butler was considered the top-rated wide receiver in the draft. He moved into the starting lineup across from veteran WR Frank Lewis and added an explosive element that soon had him facing double coverages. Bills went 7-9 to finish fourth in the AFC East while ranking 9th in the NFL in passing offense (3216 yards). Butler followed up his outstanding rookie season with a Pro Bowl performance in 1980 as he caught 57 passes for 832 yards and six TDs. 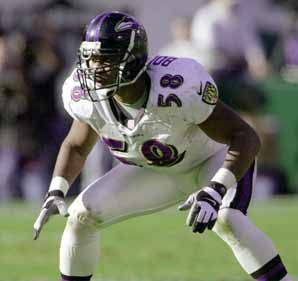 He was also a second-team All-AFC selection by UPI. While still productive, Butler was nagged by injuries in ’81, was a contract holdout prior to the strike-shortened 1982 season, and then suffered a knee injury in ’83 that required major surgery and cost him all of 1984. 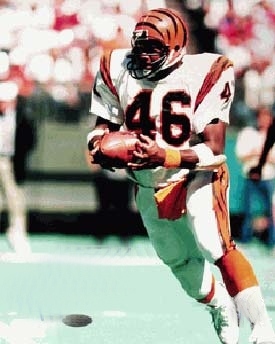 He came back with a 41-catch, 770-yard season in 1985 (18.8 avg.) 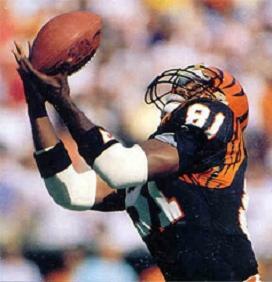 However, he caught 15 passes in 11 games in ‘86 before another leg injury effectively finished his career. Overall, Butler caught 278 passes for 4301 yards (15.5 avg.) and 29 touchdowns. The Chicago Blitz had come into the inaugural season of the United States Football League as the heavy favorites to win the title. The Blitz had the most experienced pro head coach in George Allen and a great deal of veteran talent, including 36-year-old QB Greg Landry to direct the offense and 11-year NFL veteran LB Stan White on defense. In addition, Chicago picked up two prominent rookie prizes in WR Trumaine Johnson out of Grambling and Ohio State RB Tim Spencer. The going had been tougher than anticipated in the highly-competitive USFL Central Division, but coming into the May 22 game against the visiting New Jersey Generals the Blitz had a 7-4 record and were a game behind the Tampa Bay Bandits. The Generals, coached by Chuck Fairbanks, had made the most publicized single signing going into the new league’s first year. RB Herschel Walker (pictured at right), winner of the 1982 Heisman Trophy as a junior at Georgia, had chosen to forego his last year of college eligibility and went with the USFL. But while the signing generated plenty of publicity – and controversy – and Walker overcame a slow start to become a formidable ground gainer, New Jersey overall was not a good team and sported a 3-8 tally coming into the contest at Chicago. Attendance at Soldier Field numbered a season-high 33,812 fans (helped by Walker’s presence) and they saw the visitors get the first break of the game. On Chicago’s initial possession, the Generals recovered a Landry fumble at his own eight yard line and four plays later Walker plunged over the goal line from a yard out for a touchdown. That proved to be the end of the first half scoring. Landry had a rough two quarters, completing just 8 of 23 passes for 112 yards with three interceptions as well as the fumble. Three minutes into the third quarter, Blitz DT Karl Lorch blocked a New Jersey field goal attempt, which seemed to ignite the Chicago offense. The Blitz went 80 yards in nine plays, highlighted by Landry completions of 22 yards to RB Kevin Long and 12 yards to TE Paul Ricker and culminating in a 36-yard Landry scoring pass to WR Lenny Willis. With the successful conversion, the score was tied at 7-7. Landry was 7-for-10, accumulating 128 yards, in the third quarter as Chicago’s offense played more effectively. Late in the period, the Blitz took over at their own 35, but five plays into the series, and just 11 seconds into the fourth quarter, Landry suffered a season-ending broken ankle when C Wally Pesuit was knocked into him. With the ball at the New Jersey 25, rookie backup QB Tim Koegel came into the game and the Blitz continued their drive to the two yard line. On fourth-and-one, Coach Allen elected to go for a field goal and Frank Corral was successful from 20 yards. The Blitz had their first lead of the game at 10-7. New Jersey came right back with a six-play, 72-yard possession. Walker put the Generals ahead with a 25-yard touchdown run with 8:40 left in the fourth quarter, but Dave Jacobs missed the extra point and it remained a three-point contest at 13-10. Chicago’s next drive stalled but the veteran all-purpose kicker Corral booted a clutch 63-yard punt that rolled out of bounds at the New Jersey one. Four plays later, Walker fumbled when stripped by SS Don Schwartz and CB Lance Shields recovered for the Blitz. With just under three minutes remaining in regulation, Corral (pictured below) tied the game with a 35-yard field goal and the score remained knotted at 13-13 after four quarters. In overtime, Chicago received the kickoff and Koegel’s 38-yard pass completion to Trumaine Johnson moved the ball to the New Jersey seven. On third-and-goal, Koegel, holding for an apparent field goal attempt, instead ran around left end for a five-yard touchdown and, at 3:53 into the extra period, the Blitz were winners by a score of 19-13. Chicago outgained the Generals (392 yards to 314), although New Jersey rolled up 225 yards on the ground, and had more first downs (20 to 15). The Blitz were called for 10 penalties, however, at a cost of 74 yards, while the Generals were flagged five times. Prior to suffering his injury, Greg Landry completed 15 of 33 passes for 240 yards with a touchdown and three interceptions. Tim Koegel performed well in relief, completing 6 of 9 throws for 74 yards and running for the game-winning TD. Tim Spencer led the ground game with 72 yards on 16 carries and also caught 5 passes for 70 more. WR Wamon Buggs had 5 catches for 77 yards. For the Generals, Herschel Walker rushed for 141 yards and two touchdowns on 33 carries but also suffered the key fumble in the fourth quarter. He was also one of three New Jersey receivers to catch two passes, for 17 yards, while WR Tom McConnaughey gained 36 yards on his two receptions. QB Bobby Scott went to the air 21 times and completed 10 for 112 yards with two intercepted. Four days after the game, the Blitz obtained Scott from the Generals to provide a veteran backup for Koegel. Chicago finished the regular season at 12-6 to place second to the Michigan Panthers (who had the same record but won the division title on tiebreakers) and qualify as a wild card for the postseason. They lost to the Philadelphia Stars in a come-from-behind thriller in the first round. The Generals placed a disappointing third in the Atlantic Division at 6-12. 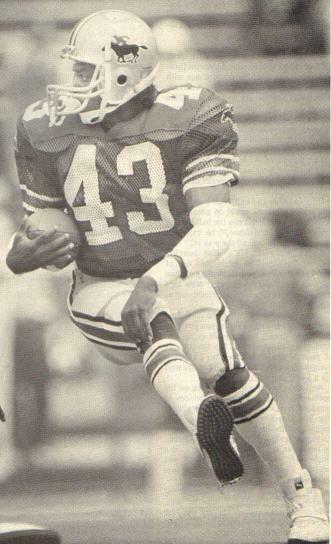 Herschel Walker was the team’s brightest star, however, leading the USFL in rushing with 1812 yards. A 24th round draft pick of the Bills (12th round by Green Bay in the NFL draft), Lamonica backed up Jack Kemp in Buffalo for his first four seasons. Often used in relief of Kemp, he was effective but became restless in the backup role and was traded to Oakland for the 1967 season. He was also mobile and led AFL quarterbacks with 289 rushing yards in 1964. Given the opportunity to start, and with a strong arm and affinity for going deep, he proved to be an excellent fit in Oakland’s vertical passing game. Raiders went 13-1 to win AFL Western Division while leading the league in scoring (466 points) and TDs (58). Won AFL Championship over Houston Oilers (40-7). Lost Super Bowl to Green Bay Packers (33-14). “The Mad Bomber” followed up in 1968 by passing for 3245 yards and 25 TD passes, and won a memorable duel against Joe Namath and the Jets in the so-called “Heidi Game”. The team went 12-2 and advanced to the AFL title game but lost in the rematch with New York. 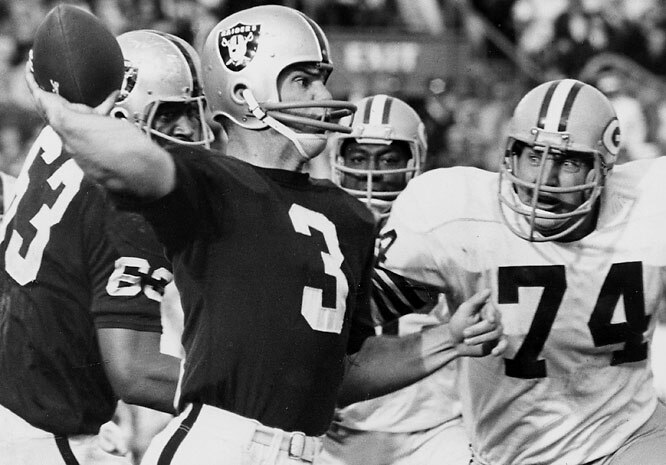 Lamonica had another MVP season in ’69, leading the league in pass attempts (426), completions (221), yards (3302), TD passes (34) and, on the downside, interceptions (25) although the team again came up short in the AFL Championship game. With the AFL/NFL merger in 1970, he was selected to the Pro Bowl but his numbers were in decline and injuries were becoming a factor. Following one more Pro Bowl selection in ’72, Lamonica lost his starting job to Ken Stabler in 1973 and, after throwing just 9 passes in ’74, played out his option and signed with the Southern California Sun of the WFL. A preseason injury knocked him out of action and he backed up rookie Pat Haden, completing just 9 of 19 passes for 90 yards with a TD and three interceptions before the league folded and his career came to an end. Overall, in the AFL and NFL he passed for 19,154 yards with 164 TDs and 138 interceptions and had a 66-16-6 regular season record as a starting quarterback (4-5 in the postseason). The Tampa Bay Bandits had gotten off to a good start in the United States Football League’s inaugural season. Head Coach Steve Spurrier’s team had an outstanding passing offense and was 7-3 in the highly-competitive Central Division. However, there was cause for concern in that veteran QB John Reaves had gone down with a broken wrist in the seventh week and his capable backup, Jimmy Jordan, suffered a shoulder separation in Week 10 at Oakland. Thus, the Bandits would have to go with an untested signal caller, Mike Kelley, in their May 15, 1983 game against the Arizona Wranglers. On the upside, rookie RB Gary Anderson (pictured above) would be making his first appearance of the season, having just signed during the previous week. A star in college at Arkansas, Anderson was drafted in the first round by the NFL’s San Diego Chargers, but they expressed an inclination to shift him to wide receiver. Anderson thus chose to sign with Tampa Bay, where he could continue to play at running back. As for the visiting Wranglers, they were 4-6 under Head Coach Doug Shively, which was good enough to remain competitive in the weak Pacific Division. 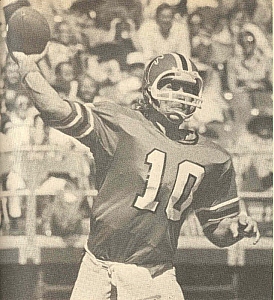 Rookie QB Alan Risher was performing ably and WR Jackie Flowers was among the USFL’s top touchdown scorers. There were 32,327 fans in attendance at Tampa Stadium and they saw the home team score first on a 49-yard field goal by Zenon Andrusyshyn. However, in their second possession the Bandits drove to the Arizona six but Anderson was stopped short on a fourth-and-one carry and the score remained 3-0 after one quarter. The Wranglers took the lead in the second quarter when RB Harold Blue ran 25 yards for a touchdown, followed by a successful extra point. After Arizona’s touchdown, the Bandits drove to the Arizona 29 but were backed up by a delay of game penalty and Andrusyshyn was then wide to the left on a 51-yard field goal attempt. Later, Tampa Bay again moved the ball to the Wranglers’ 29 but Kelley was intercepted by LB Sam Norris. Finally, CB Jeff George intercepted a Risher pass at the Arizona 49 and returned it to the 38 yard line. While he fumbled at the end, FS Glen Edwards recovered and the resulting Tampa Bay possession culminated in Kelley tossing a four-yard touchdown pass to star WR Eric Truvillion. The Bandits, despite the missed opportunities, took a 10-7 lead into halftime. The margin was extended to 13-7 in the third quarter when Andrusyshyn booted a 46-yard field goal. Then in a pivotal play, CB Warren Hanna intercepted a pass by Risher near midfield (Hanna’s third pickoff of the day). Tampa Bay took advantage on a series that ended with Anderson taking a pitchout and running for a 12-yard TD. The additional score proved to be enough – while Risher connected with WR Neil Balholm for an eight-yard touchdown, Tampa Bay was able to hold on for a 20-14 win. The Bandits dominated statistically, leading in total yards (340 to 197), first downs (21 to 10), and time of possession (34:56 to 25:04). Still, Tampa Bay was nearly undone by 10 penalties as well as four turnovers and Kelley was sacked seven times. But Arizona turned the ball over six times and struggled against the tough Tampa Bay defense. Gary Anderson had an impressive debut, rushing for 99 yards on 18 carries with the one TD and catching four passes for 54 more yards. Mike Kelley, also making his first pro start, completed 21 of 39 passes for 239 yards with a touchdown and an interception. WR Danny Buggs had 6 catches for 87 yards. For the Wranglers, Alan Risher completed 13 of 25 throws for 126 yards and a TD, but with four interceptions. TE Mark Keel topped the team with 45 yards on three receptions, and Neil Balholm also caught three passes, for 26 yards, while Jackie Flowers was limited to just two catches for 38 yards. RB Calvin Murray led the ground game with 57 yards on 16 carries. Tampa Bay ended up going 11-7 and finishing third in the Central Division and just out of the playoffs. The Wranglers completely collapsed, never winning again the rest of the way to finish at 4-14. In eight games, Gary Anderson continued to play impressively and gained 516 yards on 97 carries for a solid 5.3-yard average while catching 29 passes for 347 yards and a 12.0 average out of the backfield. 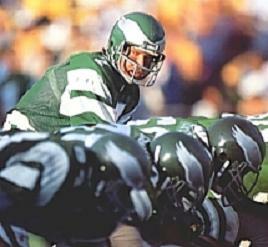 Mike Kelley won a second straight start and ended up appearing in a total of six games, passing for 1003 yards with four touchdowns against five interceptions. The Falcons traded star OT George Kunz to the Colts to obtain the first overall pick in the 1975 NFL draft in order to select Bartkowski, who passed for 2580 yards as a senior and was already acclaimed for having a strong throwing arm, although he was also immobile and strictly a pocket passer. He was immediately inserted into the starting lineup. Falcons went 4-10 to finish third in the NFC West and ranked 20th in the league in total offense (3861 yards) and 19th in passing offense (2067 yards) and scoring (240 points). Bartkowski followed up his promising rookie year with two poor seasons in 1976 and ’77, missing much time to injury and playing badly when healthy, and seemed on his way to becoming a major first-round bust. However, he regained his starting job four weeks into the 1978 season and led the Falcons to the first postseason appearance in franchise history. He also played well in the Wild Card playoff win over the Eagles and a near-upset of the Cowboys in the Divisional round. While the team dipped in ’79, Bartkowski continued to improve and had two Pro Bowl years in 1980 and ’81. He threw for 3544 yards and a league-leading 31 TDs in ’80 and a career-high 3829 yards and 30 touchdowns in 1981. Atlanta was 12-4 and back in the postseason in 1980 although again dropped back to 7-9 in ’81. The Falcons were back in the playoffs following the strike-shortened 1982 season. Bartkowski led the NFL in passing in 1983 (97.6 rating) as he threw for 3167 yards with 22 TDs and just 5 interceptions and led the league in completion percentage (67.3) in ’84. However, the team’s performance was dropping off and the effect of taking many sacks was causing shoulder and knee injuries. 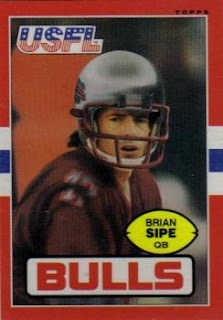 After appearing in just five games in 1985, he was dealt to the Rams where he was 4-2 as a starter in ’86 before knee problems finally finished his career. Overall, he played 11 years for the Falcons, as well as the one abbreviated season in LA, and completed 55.9 % of his passes for 24,124 yards with 156 TDs and 144 interceptions. His 23,470 yards and 154 TDs with Atlanta remain franchise career records.